The four Pakistani terrorists, who killed 19 soldiers in Uri last month in one of the the bloodiest attacks on an army camp, had used a ladder to scale the electrified fence at the LoC. Investigation carried out by the army to identify the infiltration route of the four terrorists led it to conclude that a ladder was used near Salamabad Nallah, official sources said. The army officials said that one of the four, who mounted the brazen attack in Uri, about 102 km from Srinagar, had infiltrated using the gaps along the fence near Salamabad nallah and erected a ladder on the Indian side of the fence, while the other three had a ladder on their side. The two ladders were connected like a pedestrian bridge. The sources said it was difficult for all the four to infiltrate through the gap used by the first terrorist as each one of them was carrying heavy rucksacks filled with ammunition, weapons and eatables. It would have taken them a lot of time to cross the fence at grave risk to their lives as army teams, which routinely patrol the area, could have spotted them. After the four infiltrated into India, the ladder, carried by the first terrorist, was handed over back to the two guides -- Mohd Kabir Awan and Basharat-- who accompanied them up to the LoC, sources said, adding it was done to ensure there were no tell-tale signs. The army is conducting an enquiry at Gohallan and adjoining village Jablah as they suspect the terrorists might have taken shelter there for a day before launching the deadly attack on 18 September which left 19 army personnel dead and a large quantity of arms and ammunition destroyed. The first incident of terrorists using ladders to cross the fence was reported in Machil sector of North Kashmir earlier this year. The army has launched an internal inquiry into the incident and removed Uri Brigade commander K Soma Shanker. Preliminary investigations suggested the terrorists had entered the area at least a day before mounting the brazen assault. The inquiry, which will be completed in a time-bound manner, will also suggest measures to prevent such attacks in future. Pakistan-based groups were now indulging more in "shallow infiltration" during which the terrorists, after crossing the LoC, target the first available army camp or security establishment. During the investigation it was found that the terrorists had sneaked into the army camp by cutting the perimeter fencing of the highly-guarded installation at one place. 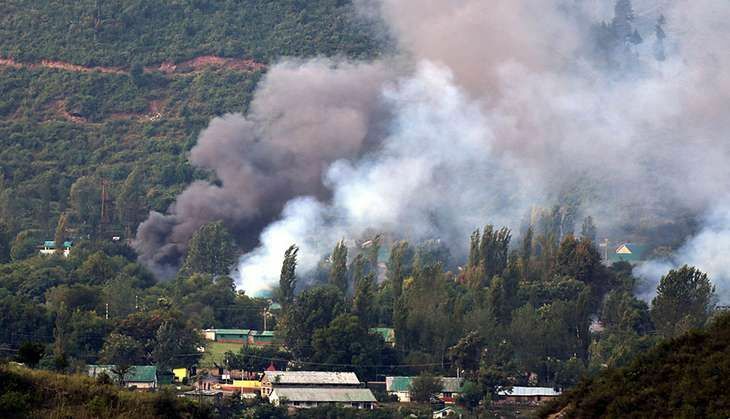 In an indication that the terrorists were well aware of the layout of the base close to the LoC, the assailants had locked the kitchen and store from outside to prevent the soldiers present inside from leaving before setting the structures on fire, they said. The investigators also said the four terrorists might have sneaked in from PoK on the intervening night of 16-17 September and stayed put at village Sukhdar, overlooking the Brigade headquarter. Sukhdar village is located at a vantage point allowing an unhindered view of the army base and movement of personnel inside it.